We produce 100% recycled cotton sheets of paper by hand at our urban paper mill in Portland, Oregon. Soft deckled edges are formed as each sheet is drawn from a vat of water and pulp. Due to the natural, handmade quality, paper may vary slightly in thickness, color, and texture. Our paper is strong, acid-free and produced with remnants from the garment industry. Deckled, cut edges, or rounded corners can be substituted on most designs (may affect pricing). This letter-weight paper is made by hand exclusively in our urban paper mill. Deckled edges are formed on this paper as each sheet is made by hand. Our own handmade paper offers soft deckled edges that are formed as each sheet is drawn from a vat of water and recycled pulp. The fiber source for our handmade paper is 100% acid-free cotton recovered from the garment industry. Stonehenge is available with a single deckled edge, cut edges, or rounded corners (does not affect pricing). Made in the USA for decades, this plush, archival cotton board offers dimensional quality and allows for an enhanced letterpress impression. Museum board is 100% cotton, 2-ply or 4-ply, and is available with cut edges, or rounded corners (does not affect pricing). 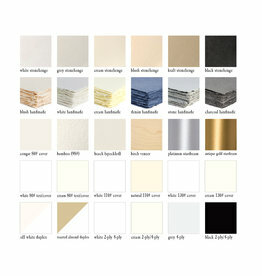 Specialty warm white paper made from renewable bamboo fibers. Beach paper is made from 100% recycled fiber in the USA. A naturally flecked recycled fiber paper made on the banks of the saint joe river. The birch veneer comes with a kraft paper backing and is produced from sustainably harvested forests. Sustainably harvested birch veneer offers a natural wood grain backdrop. The backside is comprised of kraft paper. The best canvas for saturated coverage using our soy-based inks. Available in cream or white, our 80# cover feels like a thin cardstock. This 80# cover stock paper is natural in color, with a smooth finish. Eames White - Eames has a finish that evokes a painter's canvas and adds distinctive texture. back of house info: supplied from WCP. Eames Cream - Eames has a finish that evokes a painter's canvas and adds distinctive texture. Beach - 70# text weight. Beach paper is made from 100% recycled fiber in the USA.